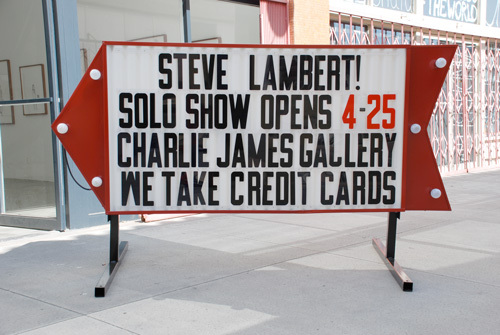 Steve Lambert at Charlie James in LA | F.A.T. In Everything You Want, Right Now!, Lambert takes on the vernacular of commercial signage with a regional emphasis unique to Los Angeles. Visually, he is interested in what makes certain styles of signage feel so innately familiar, and in the methods that signage employs to grab our attention. Lambert will investigate the numerous emotional promises that inhere in commercial advertising, promises that may excite or reassure us, while remaining ultimately undelivered. The business of fine art and the relevance of the white cube gallery will also come under the scrutiny of Mr. Lambert. Under his direction, the Charlie James Gallery will be transformed into something reminiscent of an over-eager appliance store during the 6 week run of his show. The gallery will be festooned with pennants inside and out, the windows painted over with garish promises of “Slashed Prices!” while the interior pulses away with lighted signage, all promising wild levels of deliverance to the viewer. Steve Lambert is the founder of the Anti-Advertising Agency and the lead developer of Add-Art (a Firefox add-on that replaces online advertising with curated art images). He has collaborated with numerous artists including the Graffiti Research Lab, Packard Jennings, and the Yes Men. Steve’s projects and art works have won awards from Lower East Side Print Shop, Rhizome/The New Museum, Turbulence, the Creative Work Fund, Adbusters Media Foundation, the California Arts Council, and others. His work has been shown at various galleries, art spaces, and museums both nationally and internationally, and was recently collected by the Library of Congress. Lambert has appeared live on NPR, the BBC, and CNN, with reportage of his exploits captured in multiple outlets including the Associated Press, the New York Times, the Guardian, Harper’s, The Believer, Good, Dwell, ARTnews, Punk Planet, and Newsweek. He is a Senior Fellow at the Eyebeam Center for Art and Technology in New York, and teaches at Parsons/The New School and Hunter College. Steve studied sociology and film before receiving a BFA from the San Francisco Art Institute in 2000 and a MFA at UC Davis in 2006. About Charlie James Gallery: Charlie James Gallery formed in 2008 in Seattle, WA and had its debut in Chinatown, downtown Los Angeles in November of 2008. The gallery exhibits emerging and mid-career artists confronting issues of contemporary cultural significance. Housed in a 1947 Chinatown manufacturing building and newly redesigned by Dane Johnson, the gallery is situated amidst numerous other contemporary art galleries of strong reputation. The gallery is open Wednesday to Saturday from 12-6. For more information please visit www.cjamesgallery.com or email info@cjamesgallery.com. I dig the sign. does it glow in the dark? have fun!